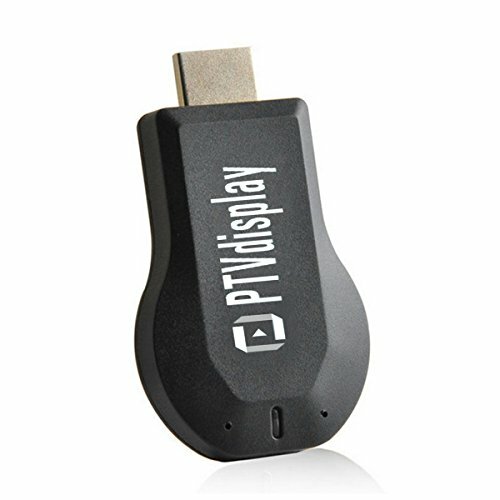 PTVdisplay cast is a media streaming device that plugs into the HDMI port on your TV. Simply use your mobile device to cast your favorite TV shows, movies, music, sports, games, and more to the TV you already own. Chromecast works with your iPhone, iPad, Android device, MacBook, Windows laptopa. To many people, it is new and inexperienced. But if you figured it out, you would be happy with this smart piece ( a little like the Rubik's Cube ). A smart friend, Phillip Wellner, tells us that the micracast app should be downloaded and it will work right later. Thanks for your experience !!! Transmission distance:Up to 15M to playback music, photo and pdf files, Up to 10M to playback video files. ★Please make sure your smart phone or tablet is Wi-Fi CERTIFIED Miracast or Airplay compatible before you buy the dongle. ★Please read the operating instructions carefully. For a certain group of people, the use of the system can be cumbersome at first. Please be patient with us. POWERFUL MULTI-COMPATIBILITY:Our Miracast dongle supports Miracast,DLNA,Airplay modes.Perfectly compatible with IOS7.0+,Android5.0+,Mac, no need driver and app installation.This dongle system will automatically updated when you upgrade IOS or Android system. UNIQUE WIRELESS DISPLAY:Absolutely casted/mirrored with photos,video,radio,music,office document(word,excel,ppt),live camera,online chat,movies,games etc.to 1080p HDTV,projector or monitor which has HD input socket from iphone,laptop,ipad,macbook,tablets,android smart phones. COMPACT POCKET SIZE:Try to imagine that portable mini size enables important business conference,office routine meeting,multimedia campus education in school,home theater entertainment take place anywhere anytime which outputs from your smart phone,tablet or macbook laptop.It is undoubted that be more economical,simple and convenient. BENEFICIAL FOR EYES:Stare at the little screen long time definitely will cause eyes uncomfortable,so that easily leads to short-sighted.But casted to large screen,stay clear away from the screen,will be more free to eyes. EASY-TO-USE OPERATION:Only 3 steps to start amazing visual journey.Plug it into specific jack on tv or monitor, then set it up connected to Router AP,finally in sharing. If you have any questions about this product by PTView, contact us by completing and submitting the form below. If you are looking for a specif part number, please include it with your message. Wireless Display Transmitter/Adapter Mirroring Screen from Phone to Big Screen by Airplay,Miracast,DLNA for iphone Android Phone Mac. 1080P HDMI TV Stick.Streaming Media Dongle.